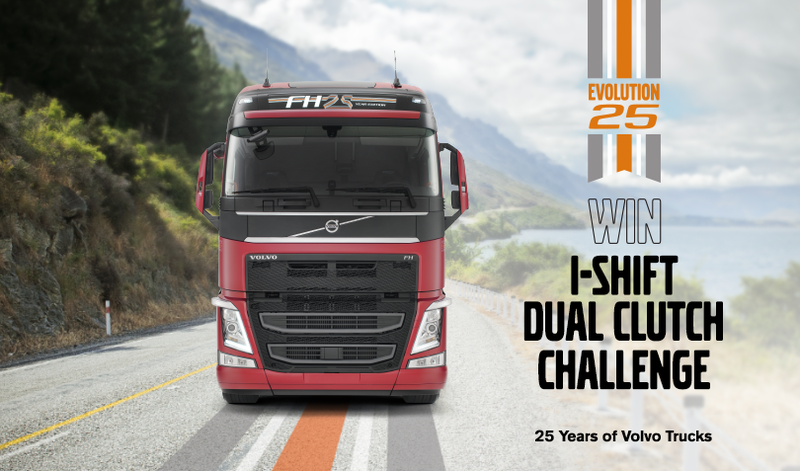 Volvo Trucks: 25 years of evolution - WIN! Be the first to put Volvo Trucks’ advanced I-Shift dual clutch to the test. We’ve got ten legs of the inaugural NZ road-trip in the brand-new 25th Anniversary FH540 with I-Shift dual clutch to give away. Plus, you’ll get the chance to win our fuel efficiency challenge and go in a draw to win a VIP trip for two to the Volvo Assembly Plant in Brisbane. Good luck! What truck do you normally drive? Number of trucks in the fleet? What industry sector do you drive for? *Why do we need this information? We need your boss to sign off on your entry into this competition. If you are one of the ten lucky winners, we’ll need to get in touch to arrange a delivery route and load for the 25th Anniversary Volvo FH540. For full terms and conditions click the link below. This promotion is managed by Volvo Trucks New Zealand. Participation in this promotion is subject to the terms and conditions.